In this section you will find some plugins I created mostly as examples for the Delphi ASIO & VST open source project. Have a look at the source code or contribute to the project and modify all the plugins. This sub-section features some of the modulation effects I created. The order is more or less alphabetic. A simple Barberpole flanger implementation. It has roughly been implemented based on this wikipedia article. A straight forward chorus implementation. A straight forward ring modulator implementation. One input is hardwired to a sine LFO. 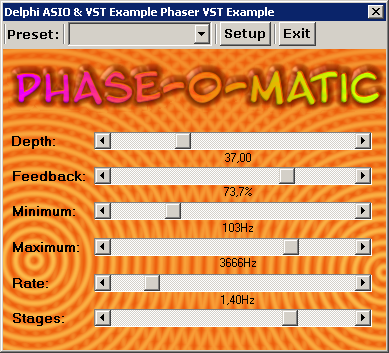 Its frequency can be adjusted to achieve this tremolo like ring modulator effect. A registry patch is available on request to increase the frequency range. A frequency shifter based on a ring modulator and a hilbert transform. This naive granular pitch shifter poorly performs pitchshifting with a lot of artifacts. It might not be used for clean pitch shifting, but if some character or dirt is desired.